This is my fourth day of following Tracy Anderson’s 30-Day Method and I’m just about keeping up with it all! Or rather the exercise is catching up with me – which I guess is a good thing because I am using my muscles and they are responding, but when I woke up today I walked downstairs like an old lady. It feel a little like I’ve been hit by a bus. I’m hoping the massive amounts of energy will start to overide the aching muscles in the next few days. I was also feeling a little light headed this morning as I prepared breakfast. I’m concerned that the menu plans are a little too light in certain areas – there’s no fat and this is actually an essentail part of any healthy diet, in moderation of course. I am looking into ways of adding a little olive oil here and there. 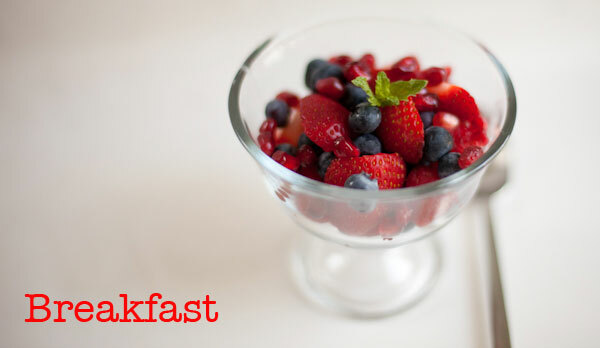 Easy and quick to prepare this little bowl of fruit lacked the protein that the last two days’ breakfasts have been packed with. I looked longingly at the non-fat Greek yogurt that was calling my name but resisted and had some extra berries. If I wasn’t sticking to this regime I would probably have this for breakfast sometime in the future with a 1/4 cup of Greek yogurt, drizzled honey and a tablespoon of sliced almonds on top. I then inhaled the delicious smell of bacon and eggs on an English muffin that I prepared for the kids – and no I didn’t consume I literally took in the delicious aroma, they say taste is 90% smell right? Layer the fruit in a pretty sundae dish and serve garnished with a sprig of mint. Being Sunday I had to think of the family as well as myself for lunch today. 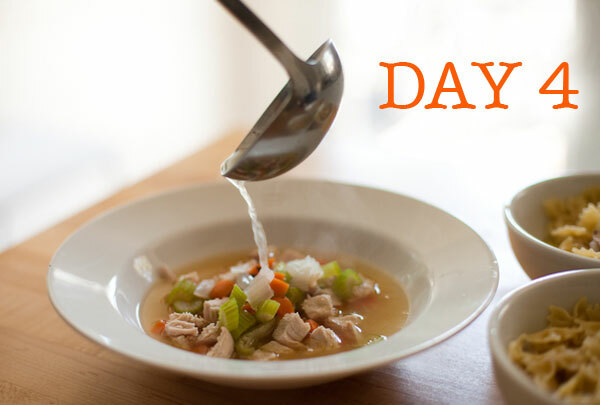 The 30 day diet calls for Chicken Protein Soup – so I adapted one of our favorite recipes from Made in America, Tom Colicchio’s Chicken Soup. They all had large helpings of pasta in their soup, I was good and stuck to the plan. We ate lunch outside in my new favorite lunch spot in the shade of the oak tree – why does food taste better eaten outside? 1. Rinse the chicken pieces under cold running water and place in a large stockpot with enough water to cover it, about 1 gallon. Over low heat simmer gently, skimming regularly for 30 minutes. 2. Add the vegetable broth, chicken stock, carrots, celery, onion and fresh herbs. Season with black pepper. Simmer for a further 20 – 30 minutes. 3. Meanwhile, over high heat bring a large pot of salted water to the boil. Add the pasta and cook until al dente. 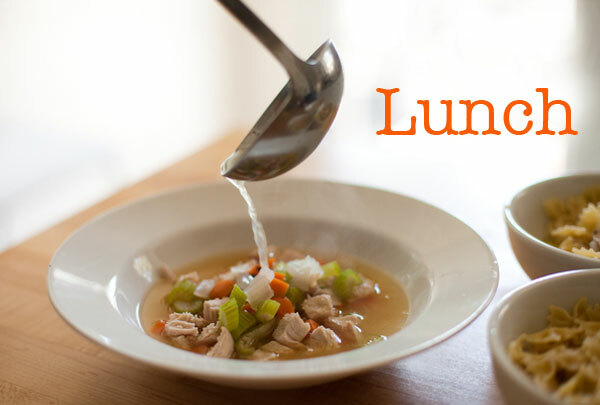 Drain, return to the pot, add ½ cup of the chicken broth and cover until ready to serve. 4. Divide the pasta into 3 of the 4 bowls, no pasta for the person on the diet. Remove the chicken from the pot and pull off pieces of chicken. 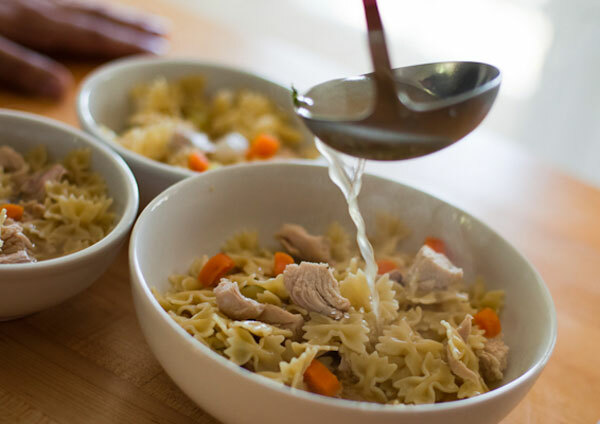 Divide this between all four bowls – making sure the bowl with no pasta gets 2 ounces of white meat. Remove some of the carrots and celery, slice and sprinkle these on top of the chicken. Finally add the hot chicken broth to each bowl and serve immediately. I was a little late getting to the snack today – and in fact I’d rather think of it as a cocktail since I was celebrating 15 years of knowing my hubby. 1. Place all the ingredients in the blender and blend to a smooth purée. 2. Serve in tall champagne flutes, preferably chilled. Cheers! Bottoms up! Call me George! The children had tucked in to another bowl of chicken soup before bed, as well as some grilled cheese with tomatoes sliced on top and two bowls of cereal. Amazingly there was still chicken left over in the soup, so instead of cooking up more chicken breast I decided to use this up. I also added some red pepper flakes to the recipe to give it some heat. This is similar in flavor profile to an Asian Chicken Salad I make a lot. I got the recipe from my friend Patricia when I lived in London years ago and it was the first meal I ever cooked for hubby back in the summer of 1996 when we met, so seems a fitting end to the 15 year anniversary celebration. 1. Heat a large nonstick pan over medium heat and add the olive oil. Using a piece of kitchen towel carefully spread the oil around the pan and remove any excess. 2. Add the chicken pieces and cook until golden brown on one side, turn and brown on the other side. Add the scallion and the red pepper flakes. Cook until warmed through, about a minute. 3. 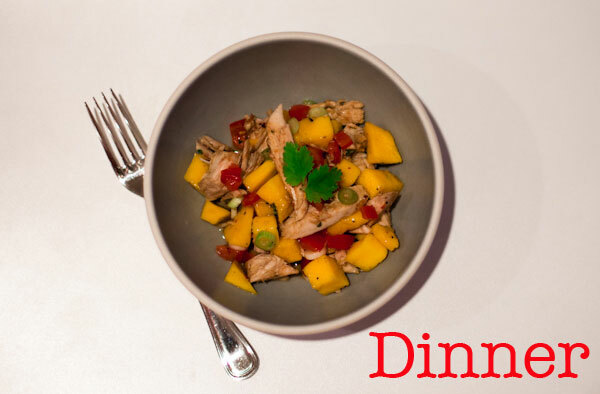 Add the mango and tomato to the pan and gentle stir together with the chicken. 4. In a small bowl whisk together the vinegar, honey and chopped cilantro. Add this to the pan and everything. The liquid will reduce down quickly. 5. Serve immediately garnished with a couple of cilantro leaves. Love those berries and your photos are stunning! that’s funny because they are new berries – but as I took them I remembered the Mexican berries too! Love Day 4! It looks delicious.